Task chair features a breathable mesh back that conforms to the body for all-day comfort. Thickly cushioned seat features tailored stitching on the fabric upholstery for an upscale look and waterfall edge to reduce pressure on the legs to enhance circulation. Center-tilt mechanism rotates the seat from a point at the center to comfortably recline. Tilt tension controls the rate and ease of recline. 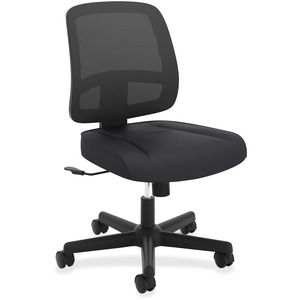 Other functions include pneumatic seat-height adjustment from 35-1/4" to 40" and 360-degree swivel. Mobility is easy with the 50mm nylon casters (hard) on the five-star base. Chair does not include arms, but an adjustable-height arm kit with two black arms is sold separately. Seat measures 19" wide x 19" deep. Back size is 18" wide x 17" high.